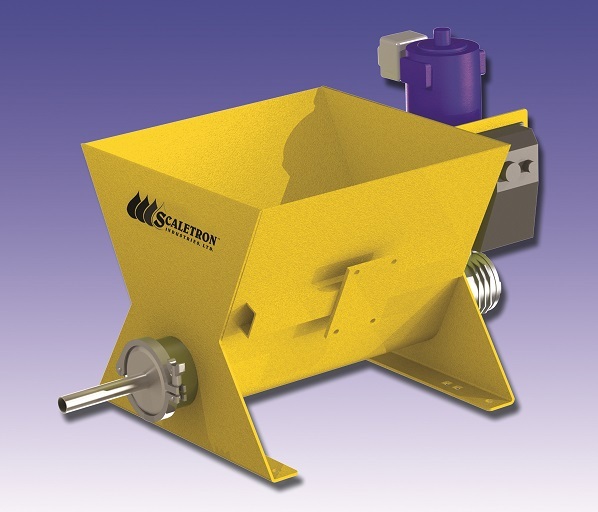 Scaletron Industries Ltd, a manufacturer of corrosion-resistant digital and mechanical scales, feeders, and batching controls, introduces a new volumetric feeder for efficient, automated dosing and monitoring of treatment process additives. The new Model VMF-90C volumetric screw feeder is designed to facilitate automatic volumetric feeding of dry polymers in water, wastewater, and chemical processing applications. A complete, standalone metering/monitoring system, the VMF-90C feeder offers operators and site managers the full gamut of basic volumetric feeding features in a compact unit that readily installs in existing dosing lines. Dougherty further explained that besides enabling more attractive pricing, pre-engineering the VMF-90C feeder helped improve both flexibility in manufacturing and Scaletron turnaround time. The new unit features rugged, carbon steel construction. Corrosion-resistant, zinc oxide-primed, dry powder epoxy coating makes the VMF-90C feeder suitable for the vast majority of work environments, and for use with virtually all industrial chemicals and additives. A built-in 1.5-cu-ft gravity fed hopper provides consistent feed rates and features a maintenance access hatch and integrated load cell attachment point. The feed screw is a ¾-in. stainless steel open helix design. An optional electric vibratory agitator readily mounts to a bracket in the hopper to help assures consistent, even dispensing of material. The adjustable SCR speed controller is housed in a water and dust proof NEMA 4X stainless enclosure. The main motor is a 90 VDC right-angle geared, wash down motor.